Commissioner, Power, Ashish Kundra chaired a high level meeting here today in presence of DC in-charge Rahul Singh and reviewed the working of the power department, particularly the measures being undertaken to ensure regular supply of electricity. PPWC members calling off its proposed Pasighat bandh on August-6 against power crisis as the Commissioner Kundra gave assurance to address its demand at the earliest. Commissioner Kundra while expressing grave concern over the erratic power supply to the centurion town Pasighat and its adjoining areas, informed that state’s Chief Minister Pema Khandu has taken the issue seriously and has directed the concerned department to complete 132kv Aalo-Pasighat tower line at the end of December, this year putting all efforts. Kundra taking stock of the progress of 132kv tower line informed that the project is at the verge of completion and only seven towers are to be erected out of 190. Out of 77 kms the department has completed 61 kms till date. All hydels would be renovated and fully functional soon. 3MW Assam (Jonai) supply supposed to be expired in October would be renewed and upgraded to 5MW if Jonai sub-station’s capacity permits. He also assured to obtain sanction from the union ministry for setting up a “Solar Power Plant” proposed by the Pasighat MLA soon in Pasighat, ensuring reliable power supply and mitigating the issues and problems of the chronic power woes of the centurion town of Pasighat and its adjoining areas. The Commissioner while admitting that time to time shutdown was necessary to carryout unpredicted maintenance works, has suggested to do it in between 6am and 11am so that people do not suffer due to long duration of power cuts. Earlier, local MLA Kaling Moyong stated that coordination amongst administration, engineers and PPWC was essential and needs to review the power supply as well as the working of infrastructure at all levels and in case of any failure, immediate steps be taken to provide respite to the esteemed consumers. Conveying his gratitude to the HCM Kandu, Moyong said that government has been very liberally providing funds for 132 kv Aalo-Pasighat tower line and more focus is on setting up of power generation projects and hence, the power department should complete the sanctioned projects on time. Before conclusion, the MLA asked the departmental engineers to provide maximum supply to the people with efficient management and distribution system. Chief Engineer (Transmission, monitoring and Planning), A. Perme and Chief Engineer Power Central Zone, T. Mara and SEs updated the Commissioner with progress reports and also hurdles being faced by them. PPWC Chairman Okom Yosung and General Secretary Oyin Moyong placing their grievances briefed the visiting Commissioner how people are suffering. The duo expressing their dismay apprised him that a series of coordination meetings were conducted but yielded no fruitful result so far. PPWC (Pasighat People’s Welfare Committee), which is leading the consumer movement against the erratic power supply, has no intention to call a bandh but the department has always miserably failed to address their grievances. They expressed their gratitude to the state’s Chief Minister and Commissioner Kundra, CEs and DCs of East Siang and neighboring districts for their assurances and immediate response to complete the 132 kv project latest by 31 Dec’16 and to renovate and repair Yembung, Sille and Rina hydels. PPWC also demanded to tap Sirpo river establish a new hydel project. 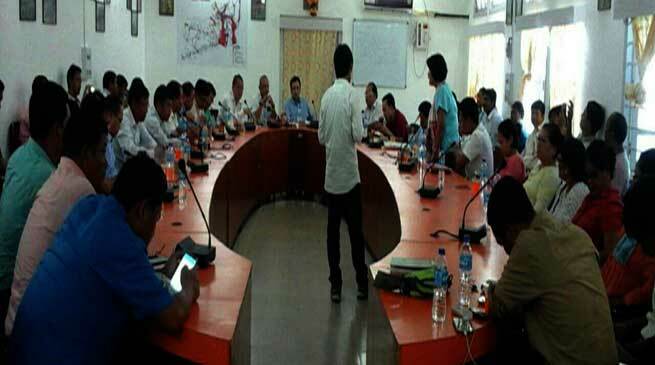 Pasighat MLA Kaling Moyong, DCs of East Siang, Siang, West Siang and Upper Siang, CEs of monitoring, hydropower, mechanical, PPWC members, student union, ABK members, ZPC, councilors, members of PMA and other senior officials took part in the meeting.